Next week will be the last Silly Sunday post. If anyone wants this meme let me know. It seems that jokes are no longer that much fun for most. I've been doing this for years and I thank Rhonda Albom for giving me this meme long ago. It's time to move on. Oooh. I wasn't expecting that. It is nice this Sunday morning to read a nice clean joke. And about what could have ended showing of our terrible man/woman relationships and treatment that has been being revealed lately. I am not a regular, but a liketohavebeen. Even I will miss these friendly but cut jokes. Mostly time allocation problems on my side. But I lurked a little bit. So am hating to see it all end. Heeheehee! That is so funny, it sounds like something Boudreaux would do. No way do i want Silly Sunday to end, it's so much fun. The problem we me having it would be work -- there's no way i can guarantee i can visit everyone who links up because of my work schedule. Please let us know what happens, and i'm likely to continue to tell Boudreaux stories on Sunday regardless. Now that sure made me laugh out loud. Sorry you are giving up this meme but don't blame you one bit. It is so hard to find Good jokes. Sandee, you and Zane have a fantastic Sunday. It isn't hard to find jokes at all. There are a bunch in Congress, for example. Oh well Sandee, maybe it's my time to also get rid of the jokes but what should I do in it's place? How about politics? No way, that's even funnier. See ya my friend. That is too funny :) Have a great day! I'm surprised that it wasn't already on YouTube. Since I can't get that with MasterCard, I'll stick with Visa. That is funny, and probably is from a true story. Sadly, today that could qualify as sexual harassment. Great joke! I--Marvelous loved it! I don't tell jokes well but I like Silly Sunday. I am so excited you got the book you won. How fun!!!!!!! Have a nice Sunday, Sandee. 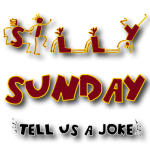 My appoligies for not doing a Silly Sunday this week.I will do one for next week,I don't want to miss out on the last one. ROFL, Love it. It's rather sad that jokes are no longer fun for people. People need to laugh more. oh dear it is a sad thing when folks cannot fall over laughing....even when times have been bad for me in the past...I could always find humor...never lost my funny bone. Big hugs honey! Funny thing is I can actually see this happening ha ha. No one was looking, but everyone was hearing. This is one of the funniest jokes I've heard in a long time Sandee. I have tears in my eyes from laughing so much. I thought it was just me, but I haven't been finding enough time to blog recently. Maybe you're feeling it too? Hi Sandee, it's sad when good things come to an end, but if it's no longer fun then Silly Sunday has run it's course. How you've come up with so many jokes in te first place is beynd me!